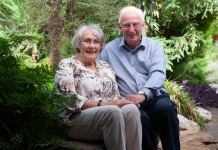 CHRISTINE Gascoyne’s large, magical garden in Gowrie is packed with a wide array of plants, including several unusual varieties she loves to experiment with. “There’s the callicarpa shrub with metallic purple berries, an amorphophallus lily with its striking flower but horrible stench, and a persicaria painter’s palette, which has irregular splashes and markings,” she says. 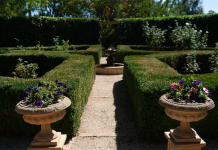 This private garden on a battleaxe block will be open on March 2-3 as part of Open Gardens Canberra’s autumn program. There is a small lawn area for Christine’s grandchildren to kick a ball, but much of the garden is hidden away along winding paths that she says seem “magical and secretive” to the kids. A hand-built parterre rose garden, succulents, trees, shrubs and perennials complete the picture, with English box hedges as dividers and deciduous trees creating a show of autumn colour. Not to be slowed down by a complicated knee replacement surgery that didn’t go as planned, Christine says she has plenty of new jobs on the go. “My latest project is the mortared rock walls, which I’ve built myself as with everything else in the garden,” she says. The rock walls are decorated with a Spanish tile bearing the initial of each of Christine’s grandchildren, picked up on her 2016 trip to walk the Camino de Santiago trail. 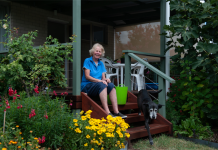 Christine says that many of the trees she planted in 2005 when she started creating the garden are now providing shade and protection for smaller and more sensitive plantings. 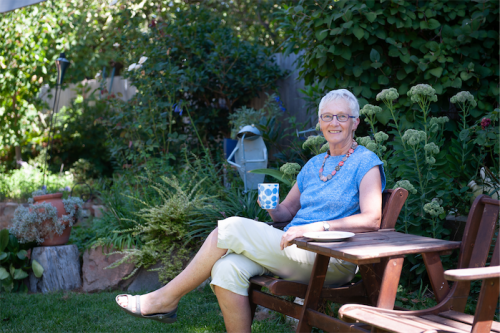 “The secret to the success of the garden is soil improvement through composting, and effective drainage,” says Christine. Devonshire teas will be available on the weekend, as well as plants for sale.